ACCOR has opened the new Ibis Hua Hin at a time when the seaside resort is growing in popularity. 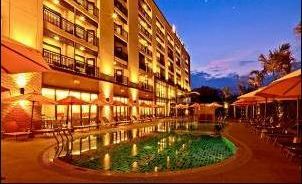 Located in Khao Takiab with easy access to the beach, the night market and many tourist attractions, this newly constructed 200 room hotel provides guests with an international quality seaside getaway at value-for-money rates. The hotel provides well-designed, and fully equipped guest rooms with contemporary fit-out including LCD satellite television, Wi-Fi, 24-hour services, quality well-priced food and drinks at the signature TASTE restaurant as well as an eight-hour non-stop breakfast concept starting from 4am to 12pm noon. Ibis Hua Hin also offers two meeting rooms for small meeting and incentive groups. Located just 200km from Bangkok, Hua Hin is a traditional Thai resort that combines modern attractions with the charm and fascination of a still active fishing port. The chosen resort of Thai Royalty for decades, Hua Hin is increasingly popular with both local and international tourists thanks to its clean beaches, world-class golf courses, historical temples and palace, fabulous parks and peaks, caves and waterfalls. Ibis Hotels Thailand executive general manager Erwann Mahe said: "We are delighted to introduce one of the world's largest and most respected economy hotel brands to Hua Hin and further extend the ibis network in Thailand to eight hotels. With an award-winning blend of quality and consistent service and value for money accommodation, we are confident that Ibis Hua Hin will quickly become one of the city's preferred hotels."